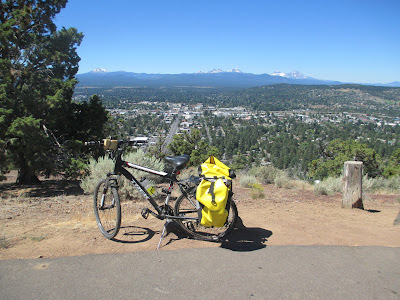 Editorials from Theslowlane: Interesting day in Bend, OR. Interesting day in Bend, OR. Lots of bike lanes around the city. Air is clearer than yesterday. I went to top of Pilot Butte. Quite a view. Then explored Old Mill District. Tall smoke stacks lead one to old powerhouse. It's now an REI store. Explored along Deschutes River paths. Starting back toward western Oregon tomorrow.